*I began this post a week or so ago using my browser on my phone as my landline internet had been disconnected in preparation for our return to Kentucky. Since my phone is a piece of crap, I only got so far before experiencing technical difficulties that I was unable to resolve. Now, that we are back in Kentucky and I have finally unpacked my laptop, I’m going to finish the post. I am leaving the part that I typed before I was forced to give up. I apologize for the long delay in updates! I type this post from my phone as I have already disconnected the internet in our apartment and I have been very vocal with my hatred of my phone and its infuriating touchscreen so please allow me to apologize in advance for any typos and probably the short length of this post. Compound that with the fact I have a sleeping 4-week old baby in my arms, so I’ll try to be concise. 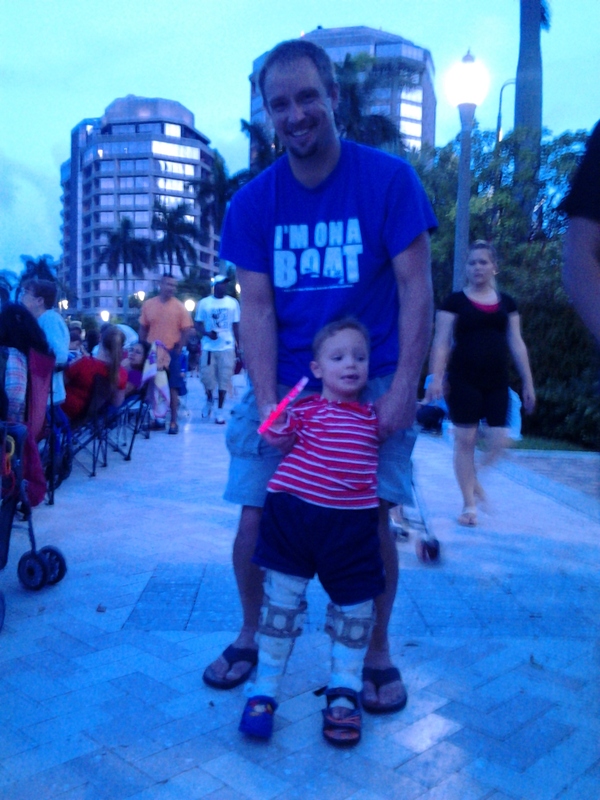 We went to the 4th on Flagler for the Fourth of July Fireworks show. Here I sit in the customer lounge of the local Dodge dealership as I wait for the service department to change the oil and other regular maintenance in preparation for our 1000-mile trip back to Kentucky. We’ve reserved our uHaul and we have a few boxes packed up. All of these actions bring on feelings of excitement and nostalgia as the hours count down to our final departure from our second home. Now, I spend a few extra moments admiring all of our surroundings and soon to be distant memories. Of course, there is no place like home, but West Palm Beach is like our second home and we’ve grown quite comfortable here, navigating the city like a local, and even building a small network of friends. We actually like this place, with its nearby beaches, abundant shopping opportunities, nice weather, and beautiful scenery. It’s a nice change from the small town life in Union County. In our last days in West Palm Beach, we took extra time to savor our “second” home, though lately it’s felt like our permanent home. I took a few strolls around Okeheelee Park. We looked at everything as if it was our last time seeing it. Drew was fitted for a new brace on his left leg. a family of three including a disabled boy. Now, Drew is up on his feet and we have an entire new person. It’s surreal. Shortly before our departure, we were reinterviewed by a local news channel to update our first story about Drew and I was asked what it was like going back home after all of this time and I said that it was as if we had been reborn. The transition our family has experienced is beyond belief or description. All in all, it’s good to be home. Our trip was surprisingly easy, despite having a delay due to Holden being admitted to the hospital over a fever putting of our departure for two days. The boys were well-behaved and posed little problem. We made it home, though our sanity has been compromised by all of the boxes and furniture that need to be unpacked, organized, and cleaned. We were stressed having to pack and load everything in preparation for our trip but none of that compares to the overwhelming stress brought on by having to reorganize almost 2000 square feet of house to accommodate all of this stuff. Sometimes, I think it would be easier if the house would suddenly and “tragically” fall into a sink hole. I don’t think Nathan or I would be too distraught! We’ve already had to secure a storage unit and are planning to host a yard sale this coming weekend to make room for everything. for the first 10-15 minutes after putting it on just to slowly acclimate his leg to a straight position, but he took to this left brace quicker than he did his right. He’s already showing off to anybody willing to look that he’s able to lift his legs by himself and stand up. He’s so excited to be fixator and cast free. His legs have suffered a lot of scarring though, something that I think we be in his favor when it comes to the playground “battle wound” competition between school boys. Now that Drew is fixator and cast free, I’ve noticed a few things that I never thought was that special before, like wearing shorts straight out of the store with no adaptation. Drew can fit inside a swimming pool kid floatie ring. We aren’t beaten up by the solid fixator rings when carrying Drew. We can hold him close. All of these things are so simple to everybody else, but for the last year we haven’t been able to do so many things because of Drew’s fixator. We no longer worry about infection from public places infiltrating Drew’s pin sites. Drew can sit at a booth in a restaurant with no adaptations. The new freedom that we all have is a relief! The top picture is a picture from fall 2011. This was about the extent in which Drew could extend his legs. This was the natural position of his legs. The bottom picture is his legs after surgery. Moving forward, we are to see Dr. Paley in October for a follow-up and then other frequent follow-ups every 3, 6, and 12 months. Drew does have one more very minor leg surgery to remove a metal rod from his left femur which will be in about 6 months. We’ll visit West Palm Beach for a few days for each consult, but nothing like our 5 and 7 month stays in our past. 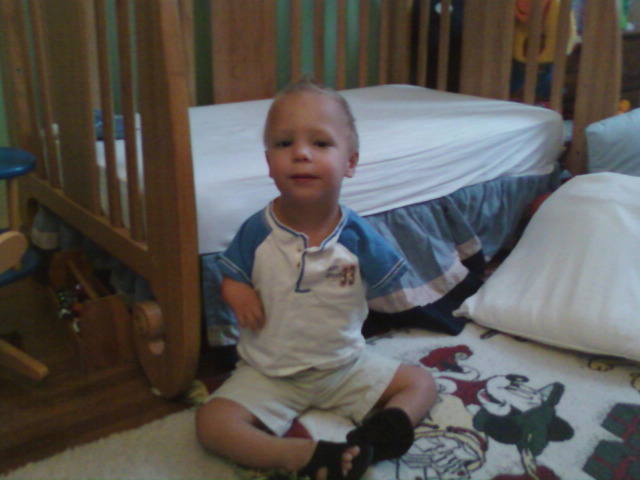 Drew is also scheduled for open heart surgery in Nashville on July 25th. So, I’ll be sure to keep everybody updated! Once again, you have brought me to tears with the eloquence of your writing. You express yourself so well. I feel like I have gone through this with you. Drew’s progress is only slightly less than miraculous, and Holden is a gift from God. As the time goes by, please continue to record your thoughts and memories. They are so uplifting to everyone who gets to read them. Thanks and love to an exceptional family.